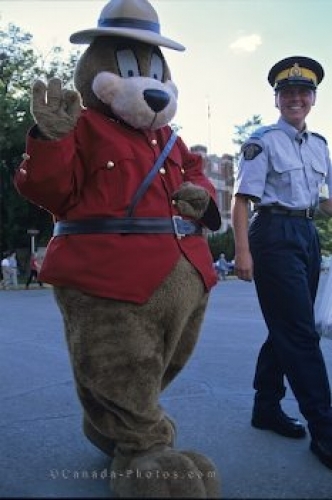 This bear mascot is part of the RCMP Academy at the RCMP Museum in Regina, Saskatchewan and strolls the grounds with a woman officer. Wearing a jacket and a hat from the uniform of the RCMP, it must get awfully hot in this costume on warm, sunny days. This bear is always willing to let people take his picture with friends or family members while visiting the museum. RCMP Academie, RCMP Museum, Regina, Saskatchewan, Canada, North America. Picture of a person wearing a nice bear costume and a RCMP uniform in Regina, Saskatchewan.